Wow, another literary legend has crossed over into the great beyond. I’ve read a great deal of Bradbury’s work over the years. By no means have I read all of it; he was too prolific. His work was hard to categorize; was it sci fi, fantasy, something else? Who cares, it was imaginative, poignant at times and always entertaining. As a teenager it was hard for me to choose between reading Kurt Vonnegut and Ray Bradbury, so I read them both. 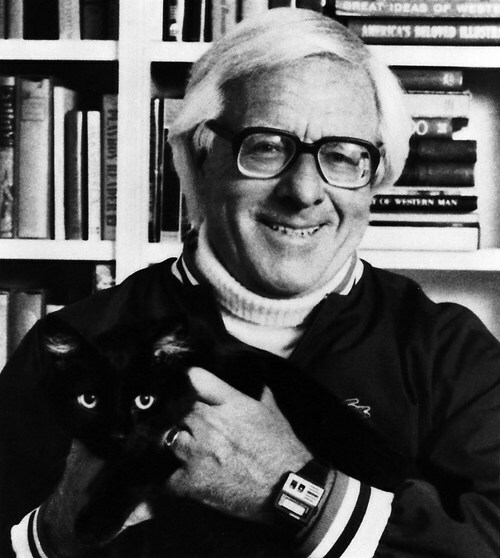 Not particularly a sci fi/fantasy fan, Bradbury made those genres enjoyable for me. His work wasn’t the technical sci fi of Asimov and Clarke and it wasn’t so fantastic that one couldn’t believe it could happen. At times there was something charming and nostalgic about his stories. For many years I was thrilled to be able to teach Fahrenheit 451. The premise of firefighters existing solely to burn books was an idea way ahead of its time and sadly, it’s coming true in the sense that books are disappearing and no longer hold the mystique for many readers. Bradbury’s short stories are chock-full of meaning as well. Many are famous such as: “A Sound of Thunder,” “The Veldt,” and “There Will come Soft Rains.” Some are not so famous: “Night Meeting,” “The Pedestrian,” or “The Fog Horn.” Most contain a familiar dystopian theme. And they’re filled with imagery and imagination. Go to the local used bookstore and pick up a copy of Something Wicked This Way Comes or The Martian Chronicles. They read like novels but are comprised of a series of short stories. You won’t be sorry. This entry was posted in authors, Fahrenheit 451, inspiration, life lessons, literature, Ray Bradbury, reading, role models, short stories and tagged books, bradbury fahrenheit 451, literature. Bookmark the permalink. Very nice blogpost, Miss Anderson!